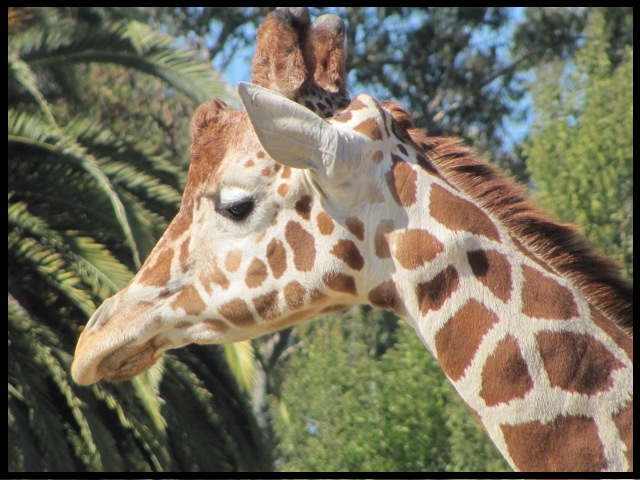 My love of giraffes began just last week when I stopped by Chris Alston's post "Hanging around at the Oakland Zoo (photos)" and felt a surprising connection with the photo of the giraffe he shared on his blog (pictured right). A few days later, I read a post entitled: "Surviving your Serengeti: An ActiveRain Challenge" and proceeded to read the first two chapters and take the "What Animal Am I?" quiz. Here's the quirker: Out of all the different animals I could have been, I discovered that I was none other than the giraffe. Talk about the chills running down my spine neck when I realized my recent bond with the giraffe turned out to be a premonition about the results of the quiz! "The giraffe symbolizes the broad meaning of the word “grace”. While some see grace in human terms as one’s elegance or charm, for others it’s divine in origin and represents that indispensable gift for the development, improvement and expansion of one’s character and the ability to rise above the negative events of time." "Grace represents style, finesse, kindness, and above all, doing the right thing – a quality that will always advance our purpose in life, no matter what it is." Health - At age 20, I was a passenger in a serious car accident that could have taken my life. Other than a recent bout with shingles in my eye last year (that I'm still recovering from), I've been pretty healthy all my life and I am thankful for that. Money - Neither one of my divorced families had a lot of money when I was growing up and I even remember my mom using food stamps when she was a single mom. When I got into real estate in 1999, wealth came quickly and easily. However, Bob and I lost a lot after the bubble burst...but we survived and we feel very lucky that things have been improving for us this past year. Family - My parents have been divorced since I was 3...and it was a nasty one due to physical abuse. In fact, they had not even exchanged kind words to each other until I was in my 30's. Bob and I, however, have been married almost 14 years (with our share of ups and downs, of course) and have 4 absolutely wonderful furkids! Style - Mine is unique and represents me; what you see is what you get. Finesse - I am a perfectionist and I associate finesse with perfection. Kindness - Being a firm believer in karma, I am a practitioner of kindness. Doing the right thing - At the end of the day, this is the rule that I live by. Homeowners who have lost their home to foreclosure. Renters (or in some cases, squatters) who occupy the homes. Attorneys who handle the evictions after foreclosure. Trustee employees who post foreclosure notices and who auction them off. Investors looking to rehab and flip the homes or hold for investment. Contractors who are hired to do the remodeling work on the homes. Buyers looking at the home when we list it for sale and hold an open house. Being a "graceful giraffe", I treat everyone with respect and kindness. Who am I to judge the homeowner who lost their home to foreclosure without first knowing their personal circumstances about how it happened? Also, since I work with real estate investors, "doing the right thing" means I handle everyone else's money like it's my own.